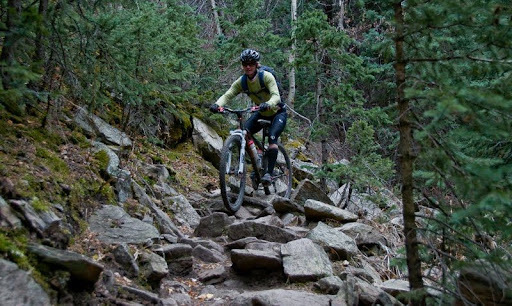 There is often talk of what it takes to complete a multi-day ultra mountain bike race. Is it fitness? A simple mantra of eat, ride, sleep? Or, something more intangible like mental toughness and the ability to keep going when it gets really tough? Naturally I have my own ideas. In my experience, the #1 prerequisite to finishing these events is stoke. Passion for a route and the experiences that await precede the start by half a year (or more) for the best rides I have had, and have seen others do. It is not so much about natural ability, it is all about positive projection, preparedness, and having the *finish* as the number one goal. Having stoke for an event well in advance of the start fuels a ton of research into the route, equipment required, conditions expected - consideration of thousands of little details that go into a great ride. 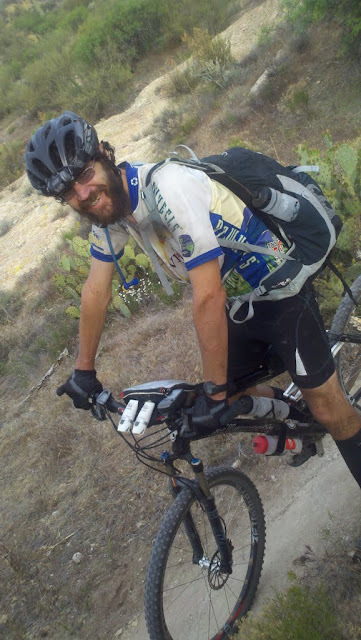 So, off we rolled last week for the AZT 300. Lynda carrying a huge bag of well-aged stoke, myself looking forward to a long ride in new terrain with the primary goal of testing my new BlueDot app. We both got what we went for and in the end it worked out to perfection. The truth is I stopped racing in 2009. After the 24 hours of Moab I walked away with a "what now??" sort of sensation, and it never went away. So, "racing", when I partake these days, is some combination of a social outlet, or means to see new terrain, or to enjoy the work that others have done to create some interesting route. The thing that has really lit the passion fire for me this spring is Bluedot - and writing code is not particularly a fitness builder or foot toughening activity, doh! Getting to the start is always an adventure...and usually involves some help from others. We stayed with Chad at his new place, and then met Kurt & Caroline in Superior for the final shuttle detail. It was a lot of fun driving to the start with the 2-time race winner/record setter. Of course we started talking race strategy...more amusing for me as I had no real race objective, and LW wanted nothing to do with it. Her clear goal was the finish. LW and I left the start fashionably late at 9:18. LW started as the lanterne rouge, an unfamiliar spot for her but it wouldn't last long. The early riding has a good bit of hike a bike, especially for me on my singlespeed and in the heat. About 20 minutes in I come up to Marshal Bird in the shade of a tree and stop to chat and have a look at a developing hotspot on my left heel. To my huge surprise it was not a hotspot at all, but a blister that had developed, popped, and the skin was blown off. Inside of 20 minutes my ride was doomed....Marshal knew I was in trouble, moreso than I was willing to concede at the time. Gorilla tape applied to heels, check. Onward. LW was in front of me know, and I eventually caught her - she pulled to the side to let me go by. A few minutes later I caught up with a big train of riders all hiking a section of marginally rideable trail. Walking was my speed here too and I settled in. LW rode it all and passed ~ 10 riders on that hike a bike, just like I've seen her do in Trans Rockies. I gave her a good shove as she went by and that's the last I saw of her until I picked her up at the finish. She had found her flow, settled down, and I knew she was going to have a great ride. I was so stoked for her at that point! In Sonoita I took my first look at BlueDot. I have put more work into BlueDot this spring than I ever have put into riding in the same time period - so to have the first look at it mid-race was oh so cool! I could see that Kurt was off the front as expected, see where LW was, and a few other riders not far up the road towards Kentucky camp. And, it actually motivated me to see if I could catch LW so we could ride together a bit. It took awhile, but nearly worked. The Kentucky camp area was my favorite part of what I rode, and good for my SS gearing. LW came into sight shortly after sunset, but then when we hit a section of rugged terrain with many short hikes my heels did me in. I just couldn't make any headway with my heel situation. I caved to the pain and rolled out the bivy for a few hours. Later when I got rolling again I was amused to learn I was right at the end of the hike a bike stuff anyway...and the trail turned instantly into a ripping, nicely carved, SS optimized super fun trail!!! Woohoo! And it stayed that way pretty much all the way to X9 road that led into Tucson. The gal at the Rincon store said LW left about 30 minutes before I got there, and that briefly gave me some motivation to hustle on up the road. But my heels were screwed by then. Raw to the point I could not walk uphill. 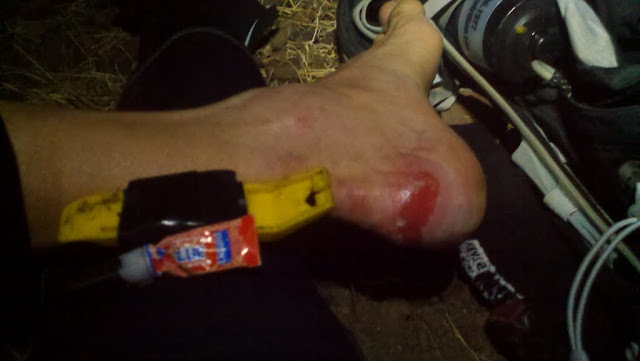 A bit of a problem when faced with 10k' vert in the next 30 miles...what good is a single speeder that can't walk? Exactly. Brad Kee and Matt Fusco showed up at the store and Brad shared some moleskin. In return for the moleskin I put my droid in his hand with BlueDot running....and that was my favorite moment of the race. He was amazed at what he held in his hand and was deeply interested in the current state of the race. According to BlueDot only Kurt and LW were up the trail, but of course we knew Joe was also up ahead. Aaron Gulley we also expected was up ahead, thinking there was probably an issue with his SPOT (we later learned his GPS failed before Tucson). In any case, Brad's excitement over BlueDot in the middle of a race was tall validation for my idea and vision to bring real-time race info into the hands of racers. The moleskin gave me a touch of confidence I might be able to get'r done, but 30 minutes after being on the bike (and not even doing any hiking yet) and the feet had said no go. So off to Scott Morris' house I rolled...I can see why it is so hard for a Tucson resident to finish this event. From that time forward it was all about LW and BlueDot. BlueDot glued to my hand, staring at LWs dot. It moved oh so painfully slow all the way to Oracle. Meanwhile, the race was unraveling on all fronts. Kurt crashed and hurt his knee just before Oracle, ending his ride. News of Aaron's demise surfaced. Then, in a surprising twist of events, news that Joe Meiser (thought to be the current leader but his poorly reporting SPOT left plenty to the imagination) had to backtrack to Oracle due to lack of calories came from Facebook. Holy crap, that put LW in the lead! Although Brad Kee was very close to her, and at one point in front of her - so there was a race for the win. He rode all through the night after leaving Rincon to arrive at Oracle before LW. Facebook to the rescue! LW's car was at the trailhead in Superior while I was stuck in Tucson. This new droid partner of mine, it is well connected. Via FB I learned Slyfox was in town. One quick email and I had a ride lined up to the trailhead with superstar Slyfox Gillie. That night was a beautiful night for riding. 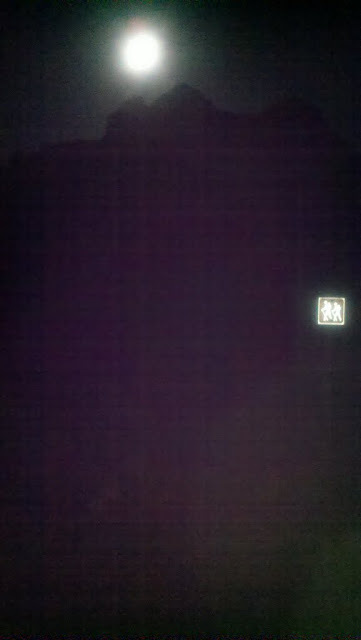 Full moon at the trailhead over picketpost really made me wish I was riding instead of waiting. 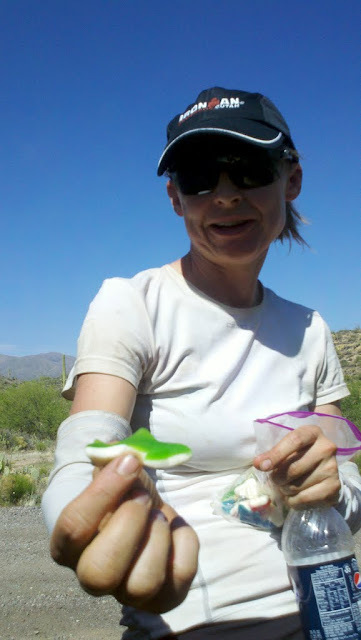 Smiling, happy, giddy, amazingly untouched by the sun, and probably under 100 lbs - the 2011 AZT 300 winner and first ever female finisher. Part of the giddiness: fueling on seafood (sharks) in the desert. We headed to town for a shower then came back out to meet Brad at his finish. 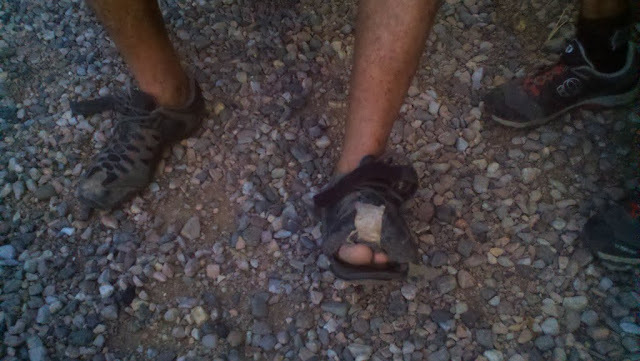 Somewhere on Mt Lemmon Brad's left shoe exploded. Post event I could not be more stoked for how it turned out. BlueDot was generally a success, and I learned a few things I need to do to improve it. Racing is the best testbed. But the real story is LW. She has been planning, scheming, dreaming, breathing AZT for months. It has dominated her training since about September or October. 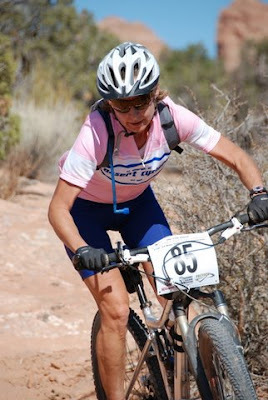 When faced with what is undoubtedly the most difficult conditions ever for this event, she embraced the challenge, adapted to the conditions, and rode her own ride, paying little attention to others. A brilliant ride with few mistakes, in my opinion it is the most impressive ride she has put down (and there have been a few!). So good, in fact, that it resulted in the first (to my knowledge, anyway) time a woman has won the overall in a self-supported multi-day. I am so proud of her! Last weekend we earned matching jerseys. 24 hour solo single speed national championship jerseys, that is. This one has been a long time in the making. As recent as 3 years ago I thought riding a SS was a freaky fringe thing - as all non single speeders do. 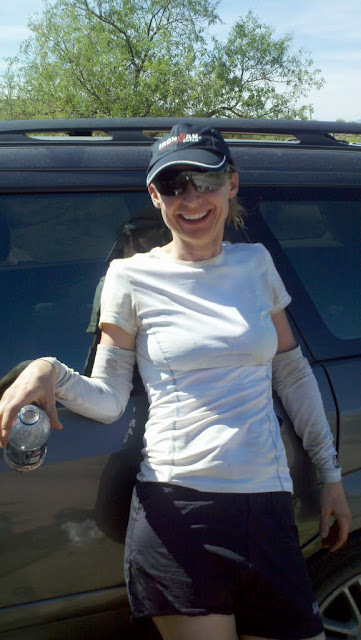 After bombing out of Moab in '07, racing with pre-existing injuries, I was certain the Moab chapter was done. 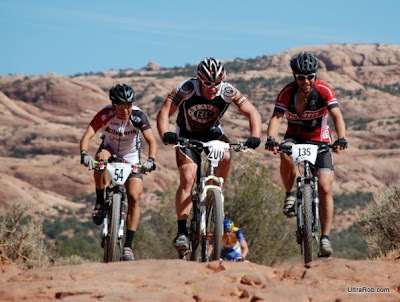 And then about 2 years ago I put a SS conversion kit on an old HT frame...and then USAC announced Moab as the venue of 24 nats for '09 - coinciding with the SS obsession - and like a moth to a flame, it was on. I got a bit carried away with the bikepacking thing this summer. Multiple sub-24s, Grand Loop, KMC, an 8 day bikepack trip with LW, CTR - it was an absolute blast but by the end of it all I was friggin smoked and not particularly fast. It was a tough pill to swallow but after CTR all long rides got the AX. Quality work was king and longer rides were 6 hours max except for one big day on the CT 3 weeks out. As Moab loomed closer, anticipation/excitement rose along with fitness. Layers of fatigue melted away, a new snap came into the legs, and power began to rocket upwards in a hurry. 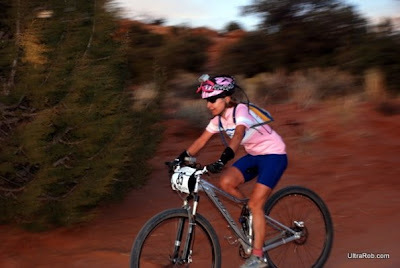 I added some key workouts that addressed my personal weaknesses that would be a key limiter at Moab...and the last one knocked me down for a good 7-8 days. But as recovery came, the peak was on - on big. Certain bits of trail that used to feel challenging became easy. I've been here before only to get carried away and peel that peak away before raceday. Not this year. LW could see it happening and told me I was gonna have the race of my life. Curiak said his magic 8 ball is never wrong WRT Moab and it said this was my year. and then Cynthia decided to come too. Kong and Adam were in to turn wrenches, keep tabs on results, and scream like maniacs as we left the pit - it just doesn't get any better than this. Mojo was in place. It's a damn good thing because the unknowns were pretty big...this is the first year USAC has recognized a SS 24 solo championship category. 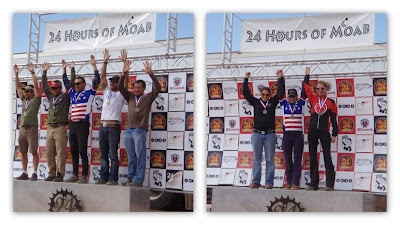 The first year to have a SS solo category at Moab. And since you could preview the start list at grannygear.com I knew I'd have my hands full with Dejay, Greg Martin, Shaun, and other honches in the field. 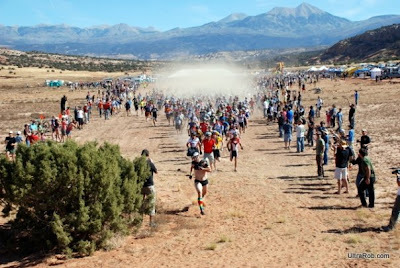 Despite the stacked field, I gotta admit it was Nat Ross who haunted my dreams pre race. In this funky dream I had Nat was at the start, riding SS, drinking a can of Red Bull then crushing the can on his forehead with a mouth full of grinning teeth. Seems I've been one place behind Nat so many times it's left a mark LOL. There's a lot more to the story but I'll try not to get too verbose. For myself, the journey is FAR more interesting than the destination, even when the destination is what we seek. This big long preamble *is* the story in my mind. 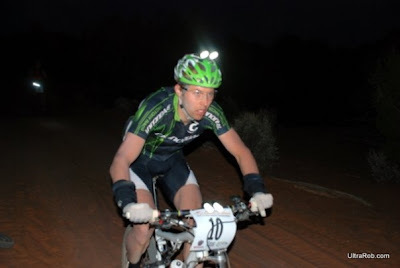 The hardest part of 24 hour racing is done once you arrive to the start line. Heading up the road on the first lap was madness. My 33.20 wasn't really tall enough to be near the front so I didn't run that hard. This probably put me about 100 riders back, and damn that's a rough place to be. Everyone was pinned and racing, it was kinda funny to be spun out and coasting through the madness. Some dude yelled "in the middle!" and stuck his elbows out between two riders that were already bar to bar and of course caused a big fat crash directly in front of me. Tempers flared (not mine, I avoided it). This was clearly a different sort of 24 hour race now that USAC and a jersey was involved. Alas, it all settled down eventually, riders spreading out. The flow was good, I felt great, and the course turned out to be fantastic fun on the SS!!! The tech/ledgy bits were every bit as ridable as with gears and the sand traps were fine too so long as they were free of wallowers. I rode with a couple SSers on the first lap - Brae was young and strong, easily cleaning a steep rock face I couldn't ride in the pre-ride and never attempted in the race. Shawn was looking strong. Dejay was out front and looking strong but was not psyched to see me on a FS: "awe FS? You gotta get a 30 min penalty for that!" I agreed immediately. I didn't expect to move into the lead so early - but by lap 2 I was out front and never looked back. I honestly thought I'd be running 1:20-1:25 lap times given the gear limitation and all the spun out sections on the second half of the course. After learning I was doing consistent 1:15's I pulled the reigns in a bit. I also ride a bit with Ernesto and Eddie Odea who I had not yet met in person. 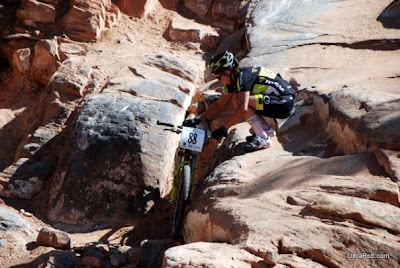 It was pretty cool to have just about the entire national level enduro field in Moab this year :) I never rode with any one person very long though. SS flow is so different than geared - the first 5 miles of the course I was relatively flying, while the flat stuff later I was relatively pokey. Meanwhile LW was putting down a solid race. I was hoping to catch her but damn she was flying. I did finally get to ride with her in the night for a bit and she looked great, climbing well and railing techy stuff in the dark. After the 2nd lap my lead continued to steadily grow. That afforded some comfort time in the pit. Instead of 30 second pits like '05, I could sit down for 5 min and stuff 400 calories plus a red bull down the piehole. Jeff Kerkove captured a video, super candid - I had no idea he was filming until the very end of the clip - that shows how awesome our pit was dialed on multiple levels. JJ keeping me fed and primed for the next lap, Cyn and Kong figuring out where in the field I am, and my nutty crack state at 3AM. Kong is trying to tell me I'm in 3rd in the open geared race and I simply couldn't wrap my head around it at the time. During the race I became entirely focused on the SS race...not sure how to embed it here, it's on facebook at http://www.facebook.com/video/video.php?v=1211372935270. Race highlights: JJ, Cynthia, Kong and Adam keeping us comfy and dialed. Seriously, it was uncanny how quickly JJ adapted to our flexible race plans and seemed to know what we needed and when. Simply brilliant! This was a complete team effort, no question. LW riding smooth, smart, tactical after having a less than ideal preparation. Clocking 15 laps for 1st SS solo. Only 2 geared riders finished in front of me...go figure. And drumroll please....we've earned jerseys before together in races, but by far the highlight is earning the stars and bars together with my dream girl. We wear these for a year. I'm not exactly sure what that means, but all the same - pinch me!